Подаємо результати підсумкового опитування Indiewire, покликаного визначити найкращі кінодосягнення 2018 року на думку кінокритиків. В опитуванні взяли участь 232 кінокритики з 32 країн, у тому числі – український кінокритик Дарія Бадьйор. Найкращим фільмом вони назвали «Рому» Альфонсо Куарона. «Донбас» Сергія Лозниці було згадано з-поміж найкращих фільмів року, які не знайшли дистрибуції у США. 232 critics from 32 different countries voted in IndieWire’s annual survey of the year’s cinematic highlights. Year-end buzz is often hijacked by noisy awards campaigns, but sometimes, it syncs up with critical consensus. That seems to be the case with “Roma,” Alfonso Cuarón’s nuanced ode to the domestic worker in his Mexican household in the 1970s. After winning multiple prizes from critics groups and topping numerous top 10 lists, “Roma” has received the most definitive endorsement from critics yet, by topping IndieWire’s year-end critics poll in the Best Film, Best Director, Best Foreign Film, and Best Cinematography categories. The thirteenth edition of the survey presents an exhaustive overview of critical favorites, with a record-high of 232 critics voting from 32 countries, making it the largest survey of its kind. The outcome illustrates the sheer range of films celebrated by critics in 2018. While Cuarón dominated the film and director categories, Paul Schrader’s “First Reformed” received significant support that landed it in the second-place slot, while Lee Chang-dong scored second place as Best Director for his Korean Oscar submission “Burning,” which critics have been championing since its Cannes debut. Critics didn’t forget about Yorgos Lanthimos’ dark regal comedy “The Favourite,” either. The twisted British crowdpleaser marked the first time that the Greek auteur worked with another screenwriter, and the result won the Best Screenplay category in IndieWire’s survey. (Originally written by Deborah Davis and reworked by Tony McNamara, the script for “The Favourite” landed just a few points ahead of “First Reformed.”) “The Favourite” also scored a Best Actress win for queen Olivia Colman (just ahead of “Roma” breakout Yalitza Aparicio), as well as a Best Supporting Actress win for Rachel Weisz, as the scheming assistant chasing Colman’s affection. The Sundance Film Festival was a launchpad for several winners in the critics poll. 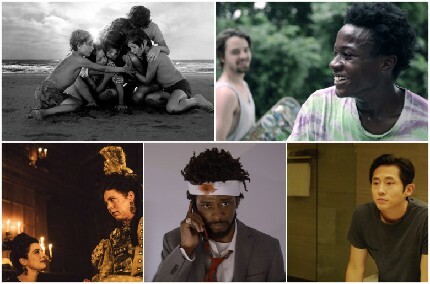 Boots Riley’s wacky anti-capitalist satire “Sorry to Bother You” won the Best First Feature category, nearly a year after it became a Sundance sensation, and it squeaked ahead of Bo Burnham’s own Sundance debut, coming-of-age dramedy “Eighth Grade,” which came in second place. Sundance also launched “Minding the Gap,” newcomer Bing Liu’s touching look at his troubled family and his skateboarding community, to rave reviews. It won the survey’s Best Documentary prize. Critics were also invited to share their enthusiasm for the year ahead by voting on the best 2019 release they had already seen. Claire Denis’ heady space odyssey “High Life,” which stars an incarcerated Robert Pattinson, topped the list following its successful fall season launch, when it landed distribution with A24. As usual with this survey, the movies that won the most support in any given category only tell part of the story. Readers are encouraged to explore each list to experience the story of the movies in 2018, and treat it as a viewing guide over the holidays. Some readers are partial to perusing individual critics’ ballots. Unfortunately, the current poll design does not allow us to display these results. However, the full list of participating critics is available, and we’re encouraging participants to share their ballots on Twitter using the hashtag #IWCriticsPoll. Note: Lynne Ramsay and Yorgos Lanthimos ultimately placed higher in this ranking, even though they received fewer first place votes than Paul Schrader, because they had more second, third, fourth, and fifth place votes. Note: Rami Malek placed above Viggo Mortensen in the ranking despite Mortensen receiving more first place votes because Malek received more second, third, fourth, and fifth place votes. Note: Rachel Weisz placed above Regina King in the ranking despite King receiving more first place votes because Weisz received more second, third, fourth, and fifth place votes. Note: Hugh Grant placed above Adam Driver in the ranking despite Driver receiving more first place votes because Grant received more second, third, fourth, and fifth place votes. Note: “Three Identical Strangers” placed above “Free Solo” and “Hale County, This Morning, This Evening” in the ranking despite the other two films receiving more #1 votes, because “Three Identical Strangers” had more second, third, fourth, and fifth place votes. NOTE: Only one film was permitted per ballot. Note: “Roma” placed higher than “Can You Ever Forgive Me?” even though “Can You Ever Forgive Me?” received more first place votes because “Roma” ultimately received more second, third, fourth, and fifth place votes. Note: “Shoplifters” placed higher than “Cold War” in the ranking, even though “Cold War” received more first place votes, because “Shoplifters” received more second, third, fourth, and fifth place votes. Note: “If Beale Street Could Talk” and “First Man” ultimately received a higher ranking than “The Favourite,” even though “The Favourite” had more first place votes, because “If Beale Street Could Talk” and “First Man” received more second, third, fourth, and fifth place votes. Christy Lemire, RogerEbert.com/What the Flick?